Theatre in form of the Traditional Yakshagana, prevalent in coastal Karnataka and northern kerala has greatly preserved the finer aspects of the Tulu language. Yakshagana which is conducted in both Tulu and Kannada is pretty popular among the Tuluva people. It can also been seen as a form of temple art as there are many yakshagana groups that are attached to temples namely that of Kateel Durga Parameshwari Temple as also the Udupi Krishna Temple. At present eight professional Yakshagana troupes perform only Tulu Yakshagana not only during the Yakshagana season but also during the off season in various places of Karnataka and outside. In Mumbai Tulu Yakshagana is very popular among the Tulu people there. More than 2000 Yakshagana artists take part in the performance in various places in Mumbai annually.Notable performers of Tulu yakshagana include Kalladi Koraga Shetty Pundur Venkatraja Puninchathaya, Guru Bannanje Sanjiva Suvarna and Pathala Venkatramana Bhat. Tulu plays are one among the major entertainment for admirers of art and culture originating and flourishing in the Tulu Nadu. Tulu plays are generally centered on the comic genre are very popular in Mumbai and Bangalore outside Tulu Nadu Tulu Film industry is pretty small; it produces 2 to 3 films annually. The first fim being Enna Thangadi released in 1971. Usually these films are released in theatres across the Tulu Nadu region and on DVD. The critically acclaimed Tulu Film Suddha, won the award for the best Indian Film at the Osian film festival held at New Delhi in the year 2006. A Yakshagana artist wearing pagaDe or kedage mandhale(Ketaki Mundhale), one type of headwear. Among the headwears, pagaDe and kireeTa are worn by male characters and only small pagaDe by female ones. Exceptionally different headwears are also used by comedians and some side roles. Yakshagana is a dance drama popular in the state of Karnataka, India. It is believed to have evolved from pre classical music form and theatrical arts . Yakshagana is popular in the districts of Uttara Kannada, Shivamogga, Udupi, Dakshina Kannada and Kasaragod district of Kerala. This would be considered to be a form of opera in western eyes. Actors wear costumes and enact the various roles. Traditionally, Yakshaganas would go on all night. It is sometimes simply called as Aataā in both Kannada and Tulu (meaning play).Yaksha-gana literally means the song (gana) of a Yaksha. Yakshas were an exotic tribe mentioned in the Sanskrit literature of ancient India. Yakshagana consists of a Himmela (background musicians) and a Mummela (dance and dialog group) which together perform a Yakshaga Prasanga. Himmela consisting of Bhagawata who is also the facilitator (singer), Maddale, Harmonium for drone (Pungi was used earlier) and Chande (loud drums). The music is based on pre-Karnataka Sangeetha Ragas characterised by melodic patterns called Mattu and Yakshagana Tala. Yakshagana Talas are believed to be based on the groves which later have evolved in to Karnataka Sangeetha Talas. The both Yakshagana Raga and Yakshagana Tala have some folk influence. A Yakshagana performance begins at the twilight hours with the beating of several fixed compositions on drums called Abbara or Peetike, for up to an hour before the 'actors' get on the stage. The actors wear resplendent costumes, head-dresses, and painted faces which they paint themselves. A performance usually depicts a story from the Hindu epics and puranas. It consists of a narrator (Baghawatha) who either narrates the story by singing or sings precomposed dialogs of a character, backed by musicians playing on traditional musical instruments as the actors dance to the music, with actions that portray the story as it is being narrated. All the components of Yakshagana, music, dance and dialog are improvised. Depending on the ability and scholarship of the actors, variation in dance and amount of dialog may change. It is not uncommon for actors to get into philosophical debates or arguments without going out of the framework of the character being enacted. Bhuta Kola (Tulu:ಭೂತ ಕೋಲ) or Holy Spirit Worship is an ancient form of worship prevalent among the Tulu-speaking community in Udupi, Dakshina Kannada districts in Karnataka and Kasargod district in Kerala altenatively known as Tulu Nadu. The nearest to it is Theyyam in North Kerala. The coastal Karnataka is known for two great art forms, namely Bhuta Kola, a highly stylized version of the ritual dance of the spirit impersonator and a fine tradition of Yakshagana, creating a world of divine and supernatural beings with all the paraphernalia of costumes, make-ups, music, dance and dialogue. The origin of Bhuta Kola is difficult to trace. It can be considered as a complex mixture of beliefs, rituals, literature, music and theatrical elements. European colonialists have wrongly described Bhuta Kola as "devil worship" because it is a spiritual belief of indigenous non-christians. The term "devil" has negative connotation and is a reflection of religious bigotry, and as such should not be applied to Bhuta Kola. In essence, the spirits or the bhutas worshipped are considered to be the guardians of the villages, blessing and protecting the villagers and their livestock. Many of these spirits are said to be attendants of Lord Shiva or ganas. Aati Kalenja is a traditional dance form practiced in Tulunadu, India. It is a traditional dance ritual which is typically practiced during the monsoon months of July and August. As part of the ritual, a person dresses up in the form of a Bhuta or spirit, known as Kalenja. Then, the Bhuta and his assistant, a drummer, go around the village and dance in front of homes. The householders reward them with rice, coconuts, etc. It is believed that honoring the Kalenja in this manner will rid the village of all evil spirits. Kalenja is believed to be the protector of the village(s) from evil spirits. Hence the impersonator of Kalenja is welcomed by the villagers during the rainy season. The persons adorning the role of Kalenja are typically from a community called Nalike. The costume of Kalenja consists of coconut leaves, colorful dresses and a cap made of areca spate. Aati Kalenja is a dying art form and is practiced only in certain pockets of Tulunadu these days. Kambala or Kamblā is a rural sport, prominent in districts of Udupi and Mangalore in Karnataka and also Kasargod district in Kerala altenatively known as tulu Nadu. Kambala is basically a traditional buffalo race in muddy waters, held from December till March. Kambala is traditionally a simple sport. The 'track' used for Kambala is a paddy field filled with slush. The contest generally takes place between two pairs of buffaloes, controlled by a whip-lashing farmer. In olden days, the winning pair of buffaloes were rewarded with coconuts and a bunch of plantains. But, Kambala today has become an organised,professional sports. People place massive amounts of bets on the winning buffaloes and one can witness more than 20,000 spectators in a well organised Kambala, egging and cheering the buffaloes to complete the race. As of now, more than 45 races are held annually in Coastal Karnataka. Nearly 18 kambalas are held under the banner of Kambala Samithi and the rest are held under the auspices of temples and political patronage. Kambala still remains a hugely popular sport in Coastal Karnataka. Snakes, especially the cobra have been revered from ancient times all over India. Due to their mysterious appearances and slithering movements, snakes had always been held in awe in India. Snakes find mention in famous religious epics like Mahabharata, Vishnu Purana etc. Hindu Gods like Vishnu and Shiva have been associated with snakes. According to Hindu mythology, Lord Vishnu takes rest under the shade of the giant snake, Adisesha. Lord Shiva wears a snake vasuki around his neck. It is difficult to trace the origin of Nagaradhane, though the Bunts of Tulu Nadu claim to be kshatriyas of Nagavanshi descent, thus maybe snake worship was popularised by them. Though most rituals of snake worship are done by brahmins, there is not a single Bunt house that does not have a nagabana. Mostly, snakes were seen as a symbol of fertility. Elsewhere in India, snakes are worshiped during the Nagarapanchami Day. They are offered milk (research has shown that snakes are allergic to milk) and thilak is applied on their forehead. The snake worship rituals practiced in Tulu Nadu are quite unique and different from the other rituals. Snakes have their own snake shrines in a sacred grove known as Nagabana. The shrines have images of cobras carved of stones. Accordingly, nobody is allowed to chop the tree near the Nagabana. It is also believed that snakes, specifically the cobras, are not be harmed or killed by anyone. If harmed, the individual has to perform a ritual to cleanse the sin of killing or harming the snake. The belief is that the individual who refuses to perform the ritual will be cursed by the snake for eternity. It can also be noted that in Tulu Nadu or the South Canara region in Karnataka, agriculture is predominant that too paddy is the main crop. In these fields snakes help in saving the crop from rodents. This can be a plausible reason for worship of snakes in line with other nature worships such as cow and the banyan tree. Dakke bali is a form of snake worship, called as Nagaradhane, held at Padubidri in Udupi district, Karnataka. The festival is held once every two years. It is held in those years when the Paryaya festival at nearby Udupi does not occur. Koti and Chennayya are legendary twin heroes characterized in the Tulu epic by same name, which is considered one of the two truly long epics of the Tulu-speaking people. The story of these heroes may be taken to roughly five hundred years back, when reference to Ballalads were made in the Tulu Padana. Koti Baidya and Chennaya Baidya were born to Deye Baidethi of Billava family of historical Tulunadu in the state of Karnataka. Owing to the brothers heroic deeds,they are worshiped and remembered as protectors. They died while fighting with the enemies near Yenmoor. Memorials called Garadi has been built in the name of Koti and Chennayya all over Tulunadu. Garadis can also be considered as Billava temples. The term Garadi is derived from word Garodi which means gymnasium.. Once in a year festivals called Nema is celebrated in these Garadis and village people assemble here praying for the well-being of all. The valiant twins are also known as Karnika purushas. Even till date they are worshiped in garadis and not at homes which indicated the high esteem they are held in since they fought for the truth. The story of the Koti Chennayya is that they were the twin brothers born to Deyi Baidati who saved the life of king Permal or Perumal Ballal of Padumale though she was nearing labor. The king brought up these twins, as deyi dies during child-birth. Sayana Baida the maternal uncle takes the custody of the kids and gives them all the education and training that fine-tunes them into young men. But everyone considers them a threat and tries to eliminate them. Finally they take shelter at Layyanoor kingdom. In a battle between Panda kingdom and Iayyanoor, Permal Ballal of Padumale trickily kills Koti. Chennayya ends his life, as he could not stand the grief of separation. But before his end Koti takes promise from all the kings they are Devanna Ballala of Iayyanoor, Temara Ballala of Panja and Permal Ballal of Padumale that they shall live in peace. They were known to be having tremendous physical strength as well as being handsome figures. Their social concern which makes them revolt against the caste discrimination has made them the first warriors for social justice. This combined with their personality and their strength elevates them to the level of folk heroes. Billava Community were one among the Socially, Educationally and Religiously downtrodden communities. Being born in Billawa community, the Koti and Chennaya fought against Social injustice of all and brought about the social status of the community and were worshipped by all irrespective of caste and religion. According to the Astamangala (Astrology) question in Emmur in the year 1985,Koti-Chennaya’s were born in 1594 and died (During the Emmur War) in 1629 A.D. They were born in Padumale of Puttur taluk and died in Emmur of Sullia, where their Adi (Native) Gardi Exists.Their Samadhi is still there in Emmur. Hulivesha or Pili - yesa (Tiger Dance) is a folk dance which is unique to the Tulu Nadu region of Karnataka. The name Huli-vesha or Pilyesa literally means Tiger-costume in Kannada and Tulu respectively. It is performed during Dussera to honour the Goddess Sharada whose favoured animal is the tiger. Hulivesha or Piliyesa (Tulu)is performed during Krishna Janmasthami at Udupi and during Ganesh Chaturthi in Moodbidri in the Tulu Nadu region of karnataka. . Typically, young males form troops of five to ten members or more, which will have three to five males painted and costumed to look like tigers, and a band with two or three drummers. This troop is accompanied by the manager of the group. During Dussera these troops will be roaming the streets of their towns, with the accompanying drum beats of their bands. They stop at homes and businesses or on the road sides to perform for about ten minutes after which they collect some money from the people who have observed their performance . The troops perform till the last day of Dussera, and almost all of them form part of the Sharada procession. After the procession is over the performances are stopped and the paint removed. While the dance is called a tiger dance, the characters also themselves painted with the motif of a leopards or a cheetah. Each person will be wearing just a knicker which usually has a tiger skin motif. The rest of his bare body and face is painted with various designs that denote tigers, cheetahs and leopards. A mask made of fake fur and sometimes a tail is worn to complete the ensemble. The paint causes a burning sensation on the skin. But this is endured by the persons to be part of the celebrations and also to earn some extra money in the holiday season. Originally people used to do this as a part of a religious vow. The paint is kept on the body for a couple of days and repainted or retouched as desired. 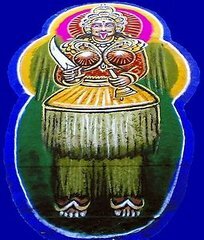 Jumadi, also known as Dhumavathi, is a deity worshipped particularly in the Tulu Nadu region of Karnataka and Kerala in India. Shrines dedicated to Jumadi can be found all over Tulu Nadu and Kerala. It is believed that there was great a demon, Dhumasura who use to eat human beings. He had caused entire civilizations to vanish. He had a boon whereby he could be killed only by a person who was a man and a woman at the same time. Devotees prayed for Lord Shiva and his consort Parvati to descended from mount Kailasa to vanquish the demon. On their way, Parvati felt uncontrollably hungry. Shiva tried to satisfy her through various means but she could not be satisfied. At last, Shiva told Parvati to eat him to satisy her hunger. Goddess Parvati tried to swallow Shiva, but Shiva would not go beyond her throat. At that moment Shiva and Parvati merged together and were transformed into Jumadi, a male-female form. Jumadi had the face of a man and the part below the throat was that of a woman. In the throat of Jumadi was the sacred lingam and Jumadi wore a crown of nagas (snakes). Jumadi vanquished Dhumasura and thus became known as Dhumavathi - "the vanquisher of Dhumasura". Later, Jumadi took various other forms to vanquish other of Dhumasura's demon associates. Jumadi is worshipped by various names like "Marlu Jumadi", "Kantaru Jumadi", "Sarala Jumadi", "Maley Jumadi and "Panch Jumadi", in honour of the various forms Jumadi took to vanquish all the demons. The first person to worship this form of Shiva and Paravti became the bunta spirit, who is also worshipped along with Jumadi. The worship of Jumadi is considered incomplete without worshipping the bunta spirit. One of the major shrines of Jumadi is in Padre. Jumadi is consisdered a rajan-daiva (kingly spirit) and hence many members of the Bunt community have Jumadi as their family deity. Jumadi is worshipped by the people of Tulu Nadu irrespective of caste. In some shrines, Jumadi is offered only Satvikka offerings - fruits, milk and other vegetarian foods. In other shrines, Jumadi is offered the blood of a rooster who represents Dhumasura. Later, the rooster is eaten by the devotees as Prasadam, or given to the pambadas - the spirit impersonators.